Joyce and Didier's conversation ranged from a discussion of sound therapy to historical fiction and magical realism; and from music producers such as Flying Lotus and Madlib to writers such as Octavia Butler and Toni Morrison. 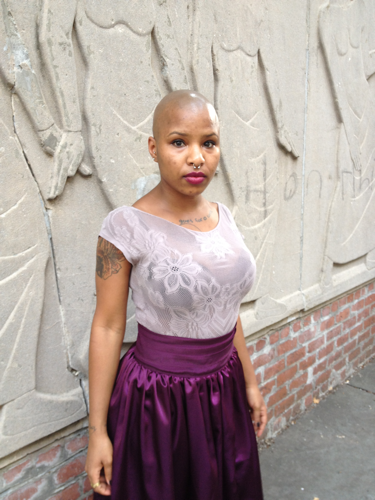 On July 26, 2013, we met up at The Pantry in Bed-Stuy for a creative conversation. The overarching themes of our conversation were afrofuturism and healing through art, which were topics we briefly discussed in passing during one of our LP workshops. “It takes a certain kind of audacity to imagine what an alternate future can look like in the face of tragedy, trauma or oppression,” Didier said. And Joyce LeeAnn talked about how she used the space of writing and the documents left behind to heal from a loved one’s death. Our conversation ranged from a discussion of sound therapy to historical fiction and magical realism; and from music producers such as Flying Lotus and Madlib to writers such as Octavia Butler and Toni Morrison. 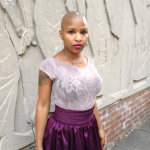 Joyce LeeAnn Joseph is a writer, archivist, performance artist and ecdysiast. Her writing explores the poetics of archival processing by reclaiming and constructing narratives through documents. The subsequent literary performances, usually accompanied by typewriter-drum kit compositions, are experiments in accessibility of these archival texts. Joyce LeeAnn’s neo-burlesque performances are an outlet to assert agency over the narrative of her flesh. Overall her work is about empowerment and healing. Didier Sylvain is an electro-acoustic composer, musicologist, and strategist. 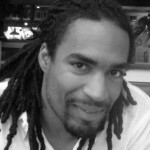 He is currently pursuing certifications in professional coaching and sound healing, as well as a PhD in ethnomusicology from Columbia University with research interests in electronic music and spirituality. As a coach, he is exploring uses of sound practices to guide artists, entrepreneurs, and organizations to deepen their presence, flow, and creative leadership. He has coached and consulted through Deloitte, Echoing Green, and Coro, and currently works with creativity incubators in New York and Oakland.